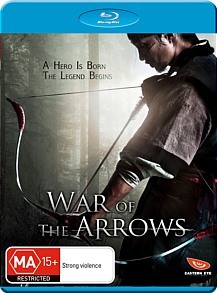 The War of the Arrows Blu-ray Review. This is a supremely strong feature from Kim, and one of the most accomplished and enjoyable Asian epics of the past several years. The Korean film industry has seen an amazing resurgence in the past decade, with films such as My Sassy Girl (2001) and The Host (2006) setting box office records in their native land and cementing South Korea’s position as one of the dominant cultural forces in the Pan-Asian region. 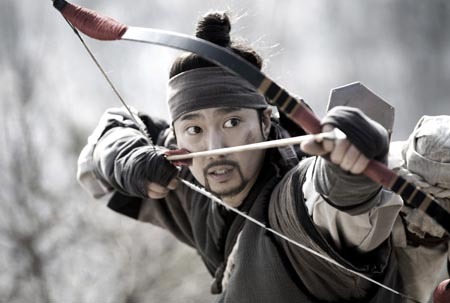 A monumental hit for previously little-known director Kim Han-min, period epic The War of the Arrows has continued this trend, garnering some 8 million admissions in its homeland alone and sweeping the Korean film awards for its year. Set in 1636 during the second Manchurian invasion of Korea (the Japanese must have been taking a breather), the film tells the story of one man, Nam-Yi, and his attempt to singlehandedly rescue his kidnapped brother and his bride-to-be from clutches of the evil Manchurians. The film’s appeal to the Korean psyche is obvious, with the archetypal archer Nam-Yi embodying both Korea itself and the struggle for liberation from tyranny in much the same way that Captain America essentially becomes America when he is doing battle with whichever US enemy is flavour of the decade, be it Nazi’s, Reds or Al-Qaeda. The only question remains: can the film appeal to Western audiences in the manner of some of its predecessors? The answer is, well, yes. Both a potent examination of revenge and an unashamedly lush visual spectacle, the film manages to transcend the confines of genre convention and brilliantly encapsulates the notion of one man’s struggle representing that of an entire nation. Kim Han-min is a consummate stylist and the film also manages a deft and believable balance between action and romance. The film’s denouement has been criticised in certain quarters as being too melodramatic for Western tastes, but anyone who’s ever seen a Hong Kong soap will find the ending positively restrained in comparison. The pathos is rather bold (or is that bald?) certainly, but not inappropriate given the privations suffered by the Korean people of the age or the protagonists in the present feature. This is a supremely strong feature from Kim, and one of the most accomplished and enjoyable Asian epics of the past several years. A short, 4-minute selection of Behind the Scenes clips, a 3-minute highlight reel that essentially functions as a glorified trailer, and the actual trailers for the film. Not a great deal on offer but it’s better than the US Blu-ray edition, which evidently contained diddly in the way of extras.